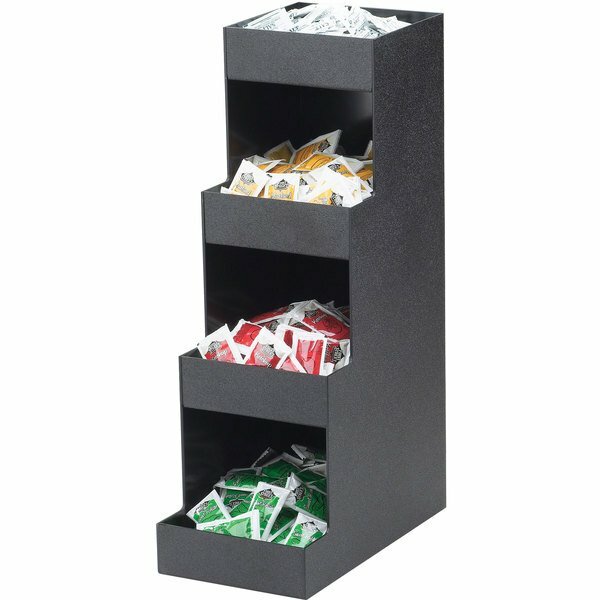 For a simple yet functional display of all of your coffee amenities, ketchup and mustard packets, salt packets, and more, use this Cal-Mil 1261 four tier condiment organizer. Its unique, stepped design features four rectangular bins, ideal for displaying whatever your guests need to sweeten their drinks or garnish their food. To maintain its lasting durability and attractive appearance, this Cal-Mil condiment organizer is made of ABS plastic that resists scratching and chipping under normal use. Cal-Mil 2045 Classic Cup / Lid Organizer with Hot Cup Sleeve Dispenser Slot - 9 1/4" x 19 1/4" x 16 3/4"
Cal-Mil 2048-4 Classic Black Slanted 4 Section Cup and Lid Holder - 4 1/2" x 19 1/2" x 19 1/4"
Cal-Mil 375-12 3 Section Clear Cup / Lid / Napkin Organizer - 13 1/4" x 5 1/4" x 8"
Cal-Mil 658 Classic Condiment Bar with Sneeze Guard - 14" x 15" x 20"
Cal-Mil 376-13 4 Section Black Cup / Lid / Napkin Organizer - 17 1/2" x 5" x 8"
Cal-Mil 2041 Classic Cup / Lid / Straw Organizer - 14 1/2" x 8 3/4" x 10 3/4"
Cal-Mil 299-13 Black Modular Lid Holder - 5 1/4" x 5 1/4" x 8"
Cal-Mil 2047 Classic Black Cup / Lid / Condiment Organizer - 14" x 22 1/2" x 20 1/4"
Cal-Mil 1259 Classic Black Coffee Condiment Organizer - 8" x 12" x 4"
Cal-Mil 787-13 Black Modular Straw Holder - 4 1/4" x 4 1/4" x 6"
Cal-Mil 2044 Classic Black Condiment Organizer with Dual Napkin Dispenser Slot - 16" x 19 1/4" x 16 3/4"
Cal-Mil 375-13 3 Section Black Cup / Lid / Napkin Organizer - 13 1/4" x 5 1/4" x 8"
Cal-Mil 2040 Classic Four Section Condiment Organizer - 11 3/4" x 8 1/2" x 4 1/4"
Cal-Mil 475-6-13 Black Melamine Ice Housing with Clear Pan - 7" x 6" x 6"
Cal-Mil 376-12 4 Section Clear Cup / Lid / Napkin Organizer - 17 1/2" x 5" x 8"
Cal-Mil 298-12 Clear Modular Lid Holder - 4 1/2" x 4 1/2" x 8"
Cal-Mil 2048-3 Classic Black Slanted 3 Section Cup and Lid Holder - 4 1/2" x 16 1/4" x 16 1/4"
Cal-Mil 475-10-13 Black Melamine Ice Housing with Clear Pan - 12" x 10" x 6"
Cal-Mil 787-12 Clear Modular Straw Holder - 4 1/4" x 4 1/4" x 6"
Cal-Mil 299-12 Clear Modular Lid Holder - 5 1/4" x 5 1/4" x 8"
Cal-Mil 298-13 Black Modular Lid Holder - 4 1/2" x 4 1/2" x 8"
Cal-Mil 2054 Classic Three Tier Double Wide Black Condiment Display with Clear Bin Fronts - 10 1/4" x 6 3/4" x 16"
Cal-Mil 2059 Stackable Black Condiment Display - 6 1/2" x 22 3/4" x 6 1/4"
Cal-Mil 2053 Classic Three Tier Black Condiment Display with Clear Bin Fronts - 5 1/4" x 6 3/4" x 16"
Cal-Mil 1246-13 Classic Black 3 Section Acrylic Packet Display - 9 1/2" x 4 1/2" x 2 1/4"
Cal-Mil 2056 Classic Black 3 Tier Bottle Organizer - 8 1/2" x 14 3/4" x 6 1/4"
Cal-Mil 2052 Classic Black Stir Stick and Condiment Display with Removable Dividers - 5 1/2" x 13 1/4" x 14 1/4"
Cal-Mil 3369-13 Black Chilled Server - 10 1/2" x 10 1/2" x 7"
Cal-Mil 3580-13 Black Extra Wide Plastic Packet Organizer - 9 1/2" x 2" x 2 3/4"
Cal-Mil 3579-13 4 Slot Black Single Serve Plastic Coffee Pod and Packet Organizer - 6 3/4" x 5" x 5"
Cal-Mil 3569-6-13 Black Plastic Condiment Holder with Removable Compartments - 13 1/4" x 7" x 23 1/4"
Cal-Mil 3577 12 Compartment Black Plastic Bulk Condiment Organizer - 16 1/4" x 9 1/4" x 13"
Cal-Mil 3308-13 Black Plastic Stir Stick Holder - 5" x 5" x 5 1/8"
Cal-Mil 378-60 Bamboo Revolving Lid / Cup Organizer - 8" x 8" x 18 1/4"
Cal-Mil 378 Classic Revolving Clear Acrylic Lid / Cup Organizer - 8 1/4" x 8 1/4" x 18"
Beautiful and classy in appearance. I was pleasantly surprised that it took a lot more of the condiments than expected. Surpassed expectations, well worth the money! This condiment holder makes a useful and attractive addition to the beverage station at your next event. It keeps all of the coffee condiments corralled for a pleasing display. We use this in the coffee shop and wine bar that is connected to a clothing store. Has served us very well over the last couple years. Holds lots of creamers, sugar packets, etc. Bottom can work as beverage napkin holder if needed as well. Large and sturdy product, will work great to hold all of the condiments needed for hotdogs and other items. Tall enough and deep enough, but most of all a great price. You will be amazed at how much this holds! We had two 2-tier caddy things we were using for sweetener packets, and all of the packets from BOTH of them fit in this unit, which takes up less counter space than one of the caddies we had before. And our small beverage napkins fit in the top slot, since we only have 3 kinds of sweetener, we don't need 4 levels. This is nice and sturdy and comes at a good price. This is a great product. It is a little expensive but it is a one time buy and it adds a lot to the setting of any shop as it looks great! It also holds a lot of product! The tier is awesome! We can put many things in it and it is very accessible. It has a great look to it and with so many compartments we can provide more options for our customers.